The great thing about paddle boarding is that it is a great activity for the whole family. Of course, if you have younger kids, then your average stand up paddle board just will not do. When my kids were old enough to ride their own paddle board, I realized just how tricky it was to find a board that was especially suited to them. So, when I finally figured out what the best paddle boards for kids were, I decided to share these findings. In this guide, I go through the features that you need to look at when searching for paddle boards for younger riders. One of the first issues that you will need to address is regarding whether you need to get a kid-specific paddle board or a smaller paddle board that is meant to adult. There is no clear cut answer to this conundrum because it really does depend on your child. For instance, if your child is over the age of 11 or on the taller side, then getting a more advanced paddle board may work. After all, there is a good chance that he or she will soon outgrow a child-sized SUP anyways. If your little one is smaller, though, then a kid-specific board will be in order. Another point to consider is skill level. If your child has been paddling for a long time and is tall enough, then they may soon get board with a kid-specific board. Here, they may be able to maneuver a bigger board more easily. Of course, if your child is only just starting out, a kid-specific board will make it easier for them to learn the fundamentals. When selecting the length of a board, there are a few things to think about. The most important factors to consider are height and capability. Let’s start with height: a shorter child is going to feel more comfortable on a shorter board. This is because it will be much easier for them to maneuver on the water. For younger or smaller kids, a board between 7 and 8 feet should work. If your child is quite tall or approaching his or her teen years, then it may be better to get them used to a slightly longer board. Depending on your child’s height, you may want to look at boards that are between 9 and 10 feet long. As mentioned, smaller boards tend to work better for beginners as they are easier to stabilize on the water. 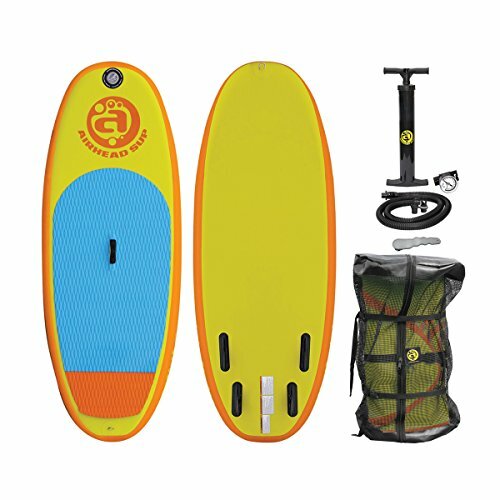 So, if your child is a beginner, a smaller board will automatically make their paddle boarding experience a lot more fun. The width is often more important than the height of a paddle board. This is because it plays a major role in stability. Typically, boards that are more than 32 inches wide are the most stable. This does depend on the length of the board, since there does need to be a balance between the length and the height. Therefore, for boards that are around 7 feet, a smaller width of 30 inches may be suitable. However, you should avoid selecting a board that is too wide either. See, boards that have a width that are greater than 34 inches may be more stable but they also lack speed. As such, your kids are going to find it really difficult to keep up with other members of the family when they are out on the water. So, look for one that is between these limits for the best results. Another thing to keep in mind when selecting a suitable paddle board for your children is the weight capacity. The good news is that most paddle board manufacturers will inform you of the weight capacity for each of their boards. It doesn’t end there, however. Before choosing a board, remember that your child is growing – probably rather rapidly. So, if you select a weight capacity that is too close to their current weight, then they may outgrow this soon. You should also think about whether your child will be riding alone or whether he or she will be riding with a sibling. If it is the latter situation, then you will need to focus on their combined weight. Make sure that any board that you do select will be more than enough to carry at least two kids. One of the most important aspects of paddle boards for kids is stability. After all, you don’t want them toppling over whenever they try to stand up. As mentioned, width is something to think about here. However, one of the biggest components of stability is the thickness of the board. You will discover that most paddle boards are between 4 and 6 inches thick, especially the inflatable paddle boards. This thickness is what helps boards to keep their rigidity and thus, the stability of the board. Since kids are lighter, they often work well with boards that are around 5 inches thick, although 6 inches is ideal. Last but not least, consider how comfortable each paddle board is for your child to lie and stand on. Here, you need to focus on the material on the top part of the board. Is it soft and has a good grip? If so, your child should be able to spend hours on their board and be completely comfortable the whole time. 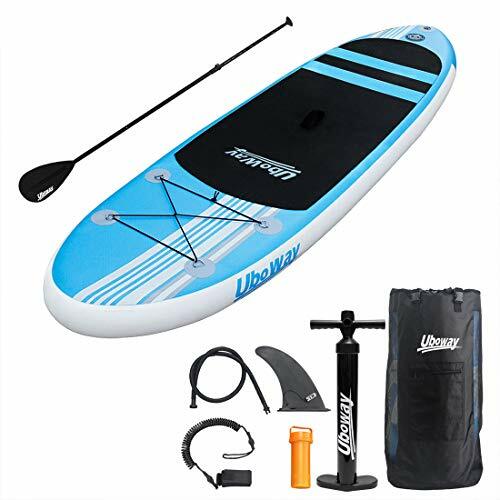 If you are trying to get your little one to transition from riding with you to getting on their own paddle board, then this is definitely the model that I would recommend. This is a kid-specific paddle board that is 7 feet in length and 30 inches wide. This, along with the six-inch width, means that this is one of the more stable boards out there. So, your child will be completely confident learning all of the basic moves on this board. This is also a good choice for younger or smaller children as the size is ideal for them. The board is capable of holding between 30 and 120lbs. I like the fact that this paddle board is equipped with four fixed thruster fins. Since they aren’t removable, you don’t have to worry about losing them in the water due to a loose connection. What’s more, the additional number of fins improves the stability of this paddle board even further. The top of the board is made from incredibly soft EVA foam which allows your child to ride on this comfortably and for longer periods of time as well. My main complaint regarding this paddle board is that it doesn’t come with a paddle – you need to purchase one separately. This paddle board is aimed at slightly more experienced or older riders. Due to the design, I found that this one of the faster kid-specific boards as well. On them, my little ones had no trouble keeping up with us adults and didn’t need nearly as much effort to do so either. At the same time, I noticed the balance was also top-notch. If your kids are already comfortable on paddle boards, they will have no trouble staying upright on this one. The other thing that I liked about this paddle board was that the maneuvering appeared a lot easier. The kids were able to turn with minimal effort. The surface of the paddle board is built quite well too. It has just enough grip to ensure that the kids could keep their balance, even when the board was wet. Still, the softness of the foam made certain that the board was quite comfortable as well. I also enjoyed the fact that this is a board that your kids will have no issue hauling around by themself. The handle and the low weight means that they can get it in and out of the water without any help. However, it should be noted that this paddle board is a solid board. As such, it does get scuffed rather easily and so, isn’t suitable for all environments. What really drew me to this paddle board was the overall construction. 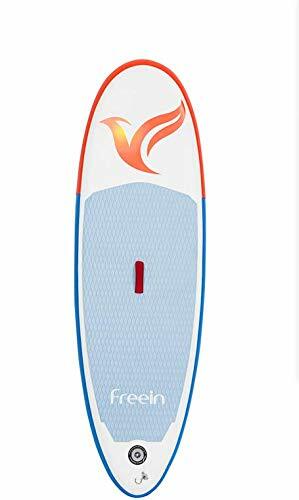 Made with dual layer technology and with high quality materials, there is no denying that this is a durable paddle board. This makes it more than suitable for all kinds of marine environments, even with a rock bottom or boulders around. Such a board also comes in quite handy if your kids have a tendency to ram into others with their boards. Despite the excellent construction, the board also manages to be quite comfortable as well. The EVA foam on top ensures that your child will be standing on soft, gentle material the entire time. While this is a kid-specific board, I would say that it is meant for kids that have been paddle boarding on their own for quite some time. At 28 inches, the width of this board is quite narrow. So, if your little one doesn’t know how to keep their balance all that well, they may find themselves tumbling over. That being said, the narrower width does make this a speedier option for the more adventurous child. I also like how rigid the board can be. With a thickness of 6 inches and an option to be blown up to around 25 PSI, this board will not sink at all. It can also take over 150lbs in weight too. If you have a teen or a taller child that is more experienced, then this board would work well for them. It is on the longer side at 9’2 and has a width of 30 inches. Due to this, your child will need to know how to balance on a paddle board properly, to be stable on this board. However, if they have the skills, they are going to have so much fun on this board. The speed alone will ensure that they will be able to keep up with larger boards without any issue at all. The maneuverability of this paddle board is pretty impressive as well. Your child will be able to easily turn and move their board at will, with very little effort on their part. The other thing that I liked about this board was the rigidity. The 6-inch thickness, combined with the 15 PSI pressure point ensures that you can inflate it to an excellent firmness. This is the reason that this paddle board can handle up to 200lbs in weight capacity! So, if your child wants to have another rider on this board, they can. Finally, the board is rather comfortable as well as so, can be ridden on for longer. On the whole, the dimensions of these paddle board may make it seem more suited to adults. This is because it is 9 feet long and 30 inches wide. However, the board has been designed incredibly well. As such, it is really easy to balance on and as long as your child has enough of experience, this board will be easy to handle. The two things that my kids enjoyed about this board were the speed and maneuverability. 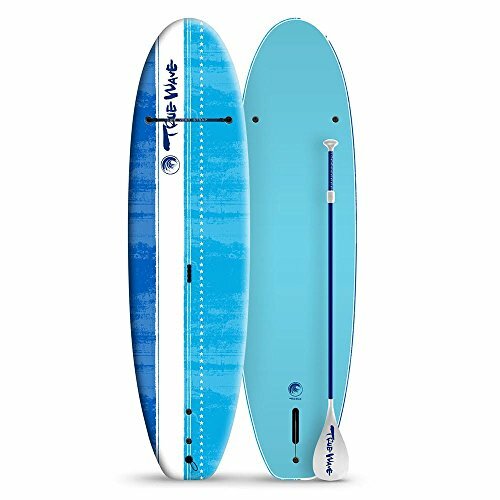 The size of the board ensures that it will be able to keep up with more advanced paddle boards without any problem. They also found it quite easy to turn and simply steer, in general. Now, you should be aware that the thickness of this board is just 4 inches. As such, it is meant for lighter riders and you shouldn’t put any additional weight on this board at all. What´s more, you need to blow up the paddle board well so that it is able to maintain its rigidity. The non-slip top of the board is an excellent feature. The grip makes it a lot easier for younger riders to maintain their balance, even when they are out on the water. 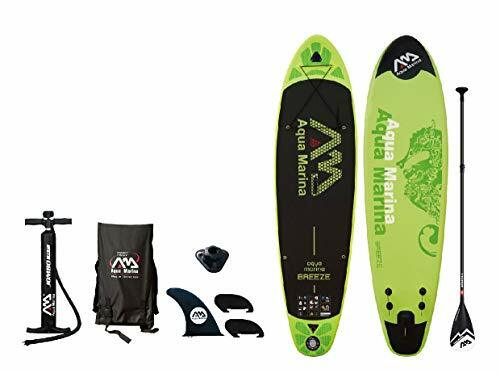 Once your child has gained a little bit more confidence in their paddle boarding abilities, I would definitely suggest this board for them. This is because at around 9 feet, this board works quite well for little ones who are more than capable of keeping their balance. Now, this is important because the width is only around 30 inches. 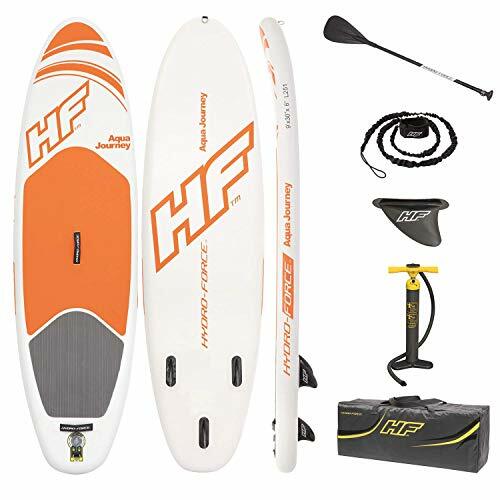 However, if your child is comfortable on a paddle board then this board will prove to be a rather high-performance one. If this is something that your child is looking for, then this is the board for them. To add to this, there is a non-slip traction pad on the upper portion of the board. As such, your child will be able to easily keep their grip when paddling. In fact, even if the board is wet, they will still be able to avoid slipping and falling. Now, this board is a rather rigid one and this is largely thanks to the thickness and how well it can be inflated. Still, you should be warned that it is no easy task to inflate this board so this is something that you will need to help your child with. This is offset, however, by the fact that the board can support around 200lbs in weight. All of these paddle boards function really well as children’s boards. However, if I had to narrow down this list, I would say that the True Wave Junior Youth paddle is the best option for youngsters. It offers excellent balance while also being a board that is easy to maneuver. For older kids or teens, the Bestway Hydro-Force board strikes the perfect balance between stability and performance. With all of the information here, finding your kid’s next paddle board should be an absolute breeze. After that, it’s just a matter of having some great, family fun!